This game has been developed based on the eight queens puzzle which was originally proposed in the 19th century. This game requires eight tankers to be placed strategically across the 8×8 board so that no two tankers are placed in the same row, column or diagonal path. Thus, a solution requires that no two tankers share the same row, column, or diagonal path. Give it a try and we assure you, DT would certainly make you go crazy. Once played, you can’t resist yourself from playing it again and again. Being a Discrete Tankers player would always provide you a discrete identity. 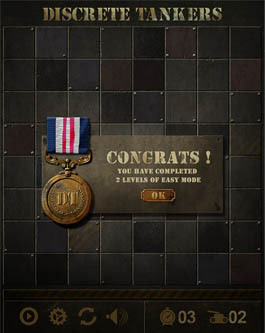 In Discrete Tankers, it would be very hard to find old school puzzle game features as in conventional board puzzle games. Comprised of originality, fun factor and thrill, Discrete Tankers gets everyone involved in the unexpected. Through DT, we offer you something that you haven’t played before, or anything similar to it. Use your coordination and skill to have endless hours of game play. 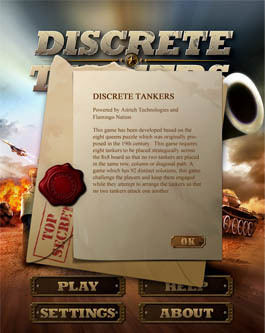 Discrete Tankers is not an overly elaborate, joyless subculture specific game type. The elegant, high definition graphics and mesmerizing sound effects has surely enhanced DT to be supreme amongst other games. Level up, learn new skills & abilities, relax, have fun and enjoy with Discrete Tankers. The game consists of a battlefield with 64 cells. 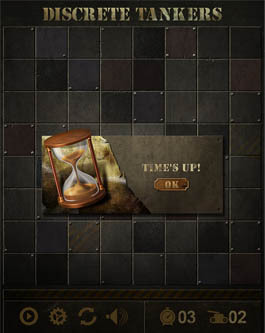 The player has to place a tanker in any of the cells. 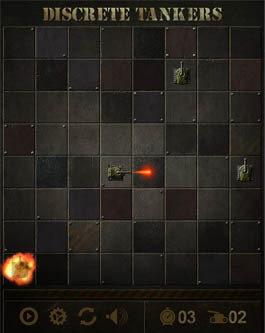 If the player places the next tank in a vertical, horizontal or diagonal position to the previous tanker, firing occurs. The previous tanker is fired away by the current tanker. 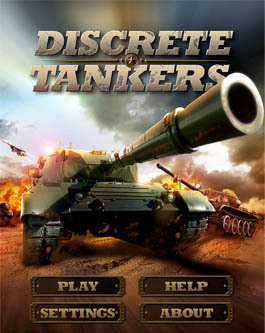 The objective of the game is to place maximum number of tankers in the battlefield without being fired away. A game which has 92 distinct solutions, this game challenge the players and keep them engaged while they attempt to arrange the tankers so that no two tankers attack one another. Discrete Tankers has been developed by Aitrich Technologies and designed by Flamingo Nation.